My book signing today was a success. I’m celebrating because I felt more comfortable in the role of author and gave my quick synopsis with ease. I also autographed twenty-seven books. Woohoo! The day didn’t start out well. The organizer for the Legends Arts & Craft Fair didn’t know I and four others were coming. We had been told to just show up, so no space had been left for us. While the organizer had words with the property manager, I stayed out of the line of fire. The other vendors scooted over to make room. 1) Publicize the event in advance. Use social media, e-mails, post flyers, get on the event calendar, make announcements at large gatherings. Be excited to get others talking about the event. Don’t depend upon the site owner to publicize the event. 2) Create an eye-catching display. The 24”x36” blue and orange poster worked well, though I had to tie it to the table legs so it wouldn’t become a kite. Indoors I’d use my floor easel. Use a solid color table cloth. Prop your book up on small easels. Include a unique conversation piece applicable to your books. 3) Do not sit behind your table. Get out in front and put on a happy face. Greet everyone who glances in your direction. Find something to talk about, but turn the conversation around to your book. 4) Give something away to break the ice. My little give-away worked wonders. 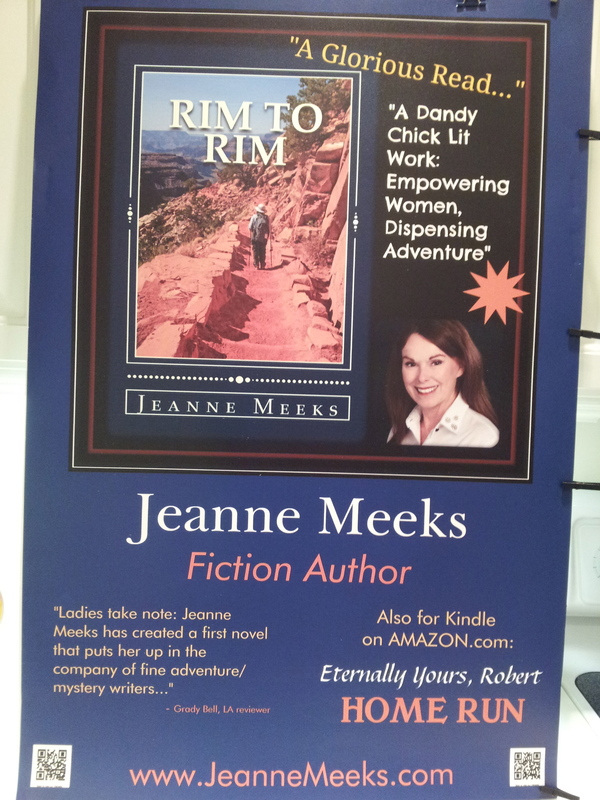 The business-sized card had a picture of my book on one side along with contact information and praise for RIM To RIM. The other side had a colorful image with a quote superimposed over it. I stapled a tea bag to the card. I smiled at each prospective reader and put the card/tea bag in their hand, saying, “A woman is like a tea bag.” They’d look at me quizzically and I’d continue, “You never know how strong she is until she gets into hot water.” (An Eleanor Roosevelt quote.) That always brought a laugh and/or comment and gave me the lead-in to talk about the theme in my novel. Often they wanted to hear more, and many then asked to buy the book. 5) Prepare to Take Payment Have plenty of small bills to make change. Twenty-five singles were not enough. Practice with your charge card reader. I was clumsy with mine and forgot my password. Several times women said they were short on cash. I said, “That’s ok. That $10 will be fine.” (rather than the $12 price). Every one of them came back with the other $2 ! 6) Offer to autograph your book Everyone said yes. I confirmed the spelling of every name, even “Pat”, using a notepad. This was especially important for people whose names I should have remembered, but didn’t. 7) Use names. Dale Carnegie’s tip for successful sales is still true. Find out their names and thank every prospective reader and book buyer, using their name. 8) Pass out business cards. Lots of them, as if they were candy on Halloween. 9) Give of yourself. Be nice. Twice visitors mentioned that relatives could be writers. I gave them my website address and offered to give tips on how to get started. I helped the woman at the next table sell her jewelry and told her customers how great the necklaces looked on them. Listen to people who just want to chat. Any one of these things might turn into a future sale. Following these tips for future events will help me feel more comfortable as I put myself out there. Even this little bit of limelight makes me uneasy. One woman even wanted to shake my hand––just because I am an author. I wish she knew that I haven’t done anything she couldn’t do. I hope I don’t disappoint her. Do the very things that scare you. Those are quite useful tips. Great quote about the Tea Bags. Thanks for posting.